As November comes to a close this year in Yellowstone Country we appreciate every single one of those beautiful, windless, crystal clear, and sunny fall days a little more than we did the week before. Years of living here reminds us that a true and deep cold will be here soon enough. This “shoulder season” of sorts also gives us a moment to pause and reflect on this past season and those that come from near and far to visit us. The three of us (Jonathan, Justin and Joe) sat down, and with the help of Hoovie and Klara, tried our best to chronicle the past year at Big Sky Anglers. Turns out we had a lot on our minds, so please sit back, relax, and join us on a journey through the past year in words and pictures. Our second year with the fly shop open is in the books and we couldn’t be happier about how it went! Operating a fly shop and guide service is no small task and we couldn’t have found a better staff to help us out. Without their hard work and dedication, we would not be where we are today. A huge shout out goes to all of our shop staff and guides – thank you so much! 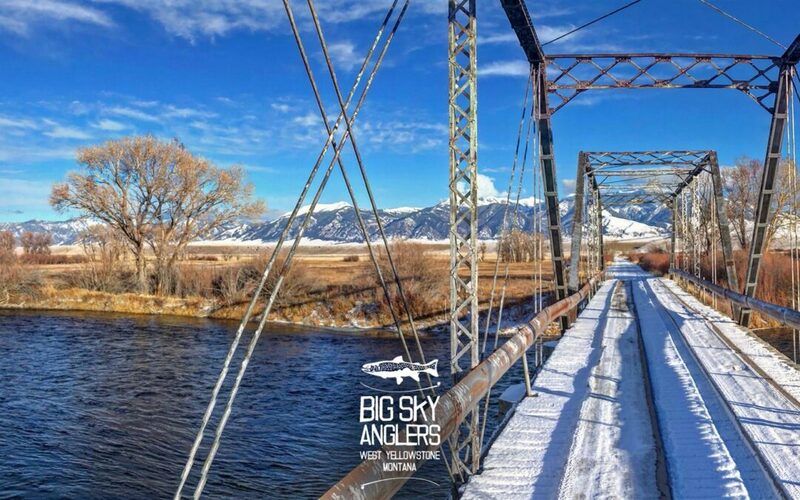 And of course, without you, the fine folks who support Big Sky Anglers, we would be flat on our butts. Thank you for your business, your friendship, and your amazing word of mouth advertising! Your feedback is invaluable to us as we move forward and grow, so please don’t hesitate to tell how us how we can better serve your needs, or what we are doing right. Our commitment to you is to be the friendliest, most knowledgeable, hardest working fly shop that we can be, both on and off the river, every single day. Somewhere along the way someone took the time to share their knowledge with us and now we are better anglers for it. Of course, by “better” we mean that we are out there having more fun! We love teaching and learning here at Big Sky Anglers, and have chosen to make that a core value of the shop and shop staff. We fully enjoy discovering new methods and ways to approach our fisheries, as well as breaking down all aspects of fly fishing so we can pass that knowledge along to you. Stay tuned in 2019 for more angling, fly tying, and casting clinics as well as technical writing and essays from guys like Robert Van Rensburg, Steve Hoovler, and Matt Klara. We often ask ourselves, “Where does all the time go?”. It seems like just yesterday that Miles and Joe were shoveling the snow off the front side walk for the umpteenth time during the “endless” winter of 2017-18. Not that we don’t like winter, but last winter was one to remember for sure! January 2018 saw very little snow until the third weekend, and then winter hit us like the Oregon Shortline steaming down Reas Pass back in the 1920’s. Once it began, the snow never stopped and each week another storm would roll in and blanket town. We posted several videos to Instagram documenting the storms, and we hope to continue that along with our snowpack reports this winter as Old Man Winter delivers the goods. Late January and February were a blur of white and we didn’t get out to fish much due to the harsh climate. Justin and Jonathan would send us photos from Patagonia, often resulting in Joe looking at Miles and rolling his eyes…another big brown trout! Good for them, we boasted! Miles kept his head down and implemented a brand new Point of Sales system for the shop, and we traded off answering the phones to book trips for the coming season and fill orders as they came in. Nancy, our Office Manager and all things Accounting, kept us sane through it all. She is now more like a big sister to us than an employee, and we don’t know where we’d be without her. Joe’s main job last winter was planning the construction of our new lodging project here in town – The Golden Stone Inn. Stay tuned for more on this exciting project through the winter! The sheer amount of forward thinking that goes into planning something like this felt almost insurmountable at times, but Joe managed to get through with the help of Nancy, Eddie, and Earl. Jonathan checked in regularly from his remote locale on Isla Monita in Patagonia, Chile, as he had a much better idea of the big picture of construction going into this. Saying that we have learned a lot from this process would be an understatement! But, we broke ground this spring, built through the summer, got her buttoned up before the snow started flying, and are thrilled with the progress so far. It looks as though we’re on track to have the doors open this coming May at the Golden Stone Inn! March brought on more snow, building glorious snowpack across the region. March also brought some time away from the Great White North (aka West Yellowstone) for Molly and Joe. They headed to Placencia, Belize for a week of fishing with Eworth Garbutt, along with some incredible snorkeling, and plenty of time on the beach with a cocktail and book in hand. 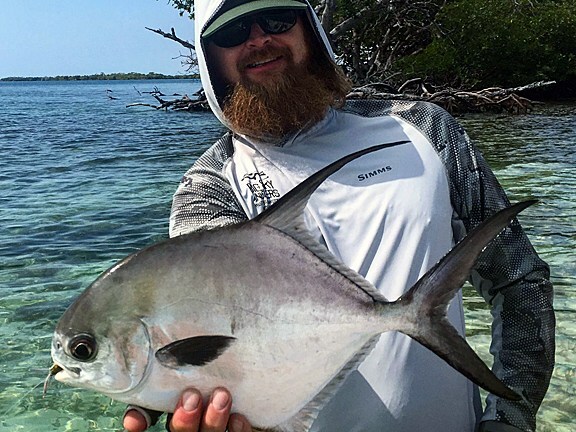 Fishing was pretty darn good down there – lots of jumping tarpon, a few bonefish, and the first permit on the fly for Joe. Also in March, Jonathan returned from the Chilean Patagonia with a better tan than everybody in the shop had combined. Ten days after Jonathan returned, Joe was on a plane to Argentina to host a fine group of anglers at El Encuentro, Estancia Tecka, and the Golden Dorado River Cruiser. What a trip that was! When Joe hit the ground in Patagonia he was greeted at the El Encuentro Fly Fishing lodge by our very own Steve Hoovler who had been there with Benjamin Beale for a couple weeks. Steve was there consulting on their up-and-coming bird hunting operation, and also assisting Benjamin with their top-notch fishing programs. El Encuentro is an amazing place and for those of you who dream of fishing Argentina with us, put this spot on the list! And don’t forget to stick around for the dorado fishing on the return trip to Buenos Aires. At some point during the winter and spring, we found time to remodel the old downstairs art gallery and transformed it into the new BSA Travel Lounge. The lounge is a great place to hang out, talk shop and plan your next travel adventure. It is also our in-shop classroom. We hosted several Spey and Euro Nymphing presentations down there this past summer and the space also doubled as our Orvis 101 classroom. We plan to bring in a library of fishing books this winter so folks can slip away and get lost in all things fishing – print is not dead! Justin arrived home from his Argentina guide season in mid-April, about the same time that new products for the 2018 season started rolling into the fly shop. This year we really upped the game on the retail side of things and added Arc’teryx, Orvis, and Thomas & Thomas, tripled the size of our fly tying department, developed a true camping section with all the essentials, added a huge fleet of demo rods, and almost doubled the inventory in our fly bins. Our wives stepped up to the plate in a big way and helped us dial in our women’s section, which includes both wading gear and cool technical and great looking apparel. Women’s specific BSA logo wear, as well as quality gear and clothing from Simms, Arc’teryx, Orvis, Fishe Wear, and Kavu now fill the entire southeast “Ladies’ Corner” of the fly shop. Even though winter can be long and harsh, our fishing season really never ends here. We have fishing opportunities all year long on the Madison, Henry’s Fork, and Missouri rivers. Sure, there are always those sub-zero stretches that one should spend tying flies instead of fishing, but the truth of the matter is, we fish year around. Matt usually phones us from the Missouri sometime in mid-January or early February with news of his first Trout Spey fish of the new year. It happens earlier or later each year depending on how good the skiing is! The main season for us begins when Yellowstone National Park opens on the third Friday in April. Fishing season doesn’t open in the Park until the Saturday of Memorial Day Weekend but that doesn’t stop the folks who are dying to get a glimpse of what winter in the Park was like from heading in with binoculars and cameras instead of waders and fishing rods. We began the 2018 season here with a very good snowpack locally and a larger than normal snowpack in the rest of the state of Montana. The resulting reliable flows were a welcome relief from the low water years of the past, we are now 2 years into solid winter and summer flows in the area, with another good winter in the forecast. West Yellowstone sits at 6666 ft above sea level, but once you get off the volcanic plateau and head down towards Ashton, ID or into the Madison Valley, things warm up and the fishing is pretty darn good in April. So it was in 2018! Donovan Best, one of our up-and-coming guides, finished up his season on Big Sky Resort’s Ski Patrol and jumped right into the guide season fishing the Gallatin, Henry’s Fork, and Madison throughout April. April is actually a great month to combine some great skiing with some fun fishing if you are like us and love both of those activities! Joe was on the Mo for late April and most of May, teaming up with Greg Falls and our guide crew up there for a few weeks of guided trips. They had excellent early season fishing and even managed to find a few morel mushrooms and asparagus which pop at that time of the year. Don’t ask them where they find ‘em though… if you’re lucky they’ll give you a few to snack on! Overall, May found us dealing with higher flows than normal. When the snow finally stopped, it started to rain in the valleys. The rivers around Montana and Idaho swelled, and when Joe left the Missouri in late May she was flowing at 17,000 cfs, and still climbing. We actually like high water. It is typically good for the rivers, and high flows really help the trout out through the middle of summer. But anglers (us included) don’t always like the big water when it gets in the way of their fishing plans. It helps if you enjoy stillwater angling as well as the river game, or don’t mind the necessary adjustment to working slow and deep along the margins with big nasty stuff. The one thing we can’t control is Mother Nature. She rules the roost when it comes to the pursuit of outdoor endeavors. We choose to adjust our own approach to the outdoors, and enjoy whatever conditions come our way in the spring. While Joe was up on the Mo, our guides here in West Yellowstone were floating the Madison when the weather was cool enough to keep it clear and fishing the Henry’s Fork chasing march browns, spring Baetis, and a pretty solid Mother’s Day Caddis hatch. These early hatches provide a little dry fly fun in the middle of a day of good nymph fishing and are short but sometimes very intense. The Henry’s Fork always maintains some clear fishable water at this time of year, regardless of what the flows are doing elsewhere during runoff. When Yellowstone’s fishing season opened on Memorial Day weekend, the water was high but fishing was pretty good. The rain had melted off most of the low elevation snow and the Firehole produced some quality days, as swinging softies and fishing streamers fooled plenty of fish. This was the first year that Yellowstone Perk banned felt-soled wading boots, and we heard from lots of anglers about the trials and tribulations of wading without felt for the first time. Without question, felt works…rubber soles can be slick… and one must be careful. But, as we do with barbless hooks, we choose to accept the challenges that come with rubber soles because it helps protect our resources. Hands down, the bestselling boot/sole for us this season was the Korker’s Alumatrax sole. These soles flat out grip the bottom of the river like Spiderman sticks to the walls in Stan Lee’s (RIP Stan) comic books. Our strong snowpack manifested into very good stonefly hatches on most of our region’s waters, starting with the first of them to fire off – the Henry’s Fork, around the third week in May. Just about the same time, Hebgen Lake was producing heavy midge hatches and the big rainbows and browns went on their usual post-winter feeding binge. Good nymph fishing prevailed throughout the early portion of the month on both the Madison and the Henry’s Fork. Much of our guided fishing concentrated on the Henry’s Fork later in May as the Madison went through a much-needed flushing phase. From the middle of the month on, Salmonflies were the main fare, and nymphing and dries both produced some great days on the Fork. Summer seemed to arrive during the first week of June here in the mountains, and our first really dependable dry fly fishing of the year, outside of the big stoneflies, began in earnest about the middle of June on both the waters of western Yellowstone National Park and the Henry’s Fork. PMDs, caddis, green drakes, grey drakes, flavs, yellow sallies and western olive stones all began to hatch in overlaying sequences as is the norm. Salmonflies began to show themselves on the Madison near Ennis around the 21st of June, and then provided us with three weeks of entertaining big bug fishing as the rest of the waters in the area began to drop and clear, by the middle of July we were enjoying great fishing all around Yellowstone National Park, on the Madison, and on much of the Henry’s Fork. June might be one of the most anticipated months of the year on the Henry’s Fork in Idaho. This year the higher than average flows pushed into the later part of the month, which made some of the early hatch dry fly fishing more challenging than usual, but by mid-month it had hit its stride. On the Fork, this pattern has the effect of keeping the lower river fishing well longer through the end of June and into the beginning of July. Flows never spiked very high through the system as the irrigation demands of farmers downstream were met by good snowpack elsewhere. Consistency in flows was a treat that lasted through much of the season. High water years like this produce great stonefly hatches and fishing, and this year we were throwing golden stones on the Henry’s Fork from the third week in May on the lower river well into July on the upper. The last weekend of June marked our “Second Annual Grand Opening Celebration”, with lots of sales, kids art with our great friend Mimi Matsuda, dealer reps, fly casting in the Park, rod giveaways, an awesome hosted BBQ at the shop, and more. It’s so much fun to see everyone out having a good time! Not to get ahead of ourselves, but please save the date for our THIRD ANNUAL GRAND OPENING CELEBRATION this summer – Saturday, June 29th 2019! July and August provided us with the longest stretch of stable and sunny weather that the summer had yet seen. Fishing stayed consistently good throughout the area, with favorable flows in much of the region. The Henry’s Fork once again solidified its role as an all-season fishery in its own rite, the Madison reclaimed its throne as the king of summertime fisheries with some stellar fishing, and the freestone rivers and creeks of Yellowstone National Park remained at historically comfortable flows throughout the heat of summer. Hebgen lake began to produce serious Callibaetis around the middle of June and the production didn’t stop until almost the middle of September. Jonathan took a pack trip with llamas (this was a first!) and a small group of anglers into the backcountry of Yellowstone. They had a great time float tubing some remote stillwaters and fishing around some of the small high country streams. Next year they’re heading back into another quadrant of the park, outfitted with float tubes and a string of llamas again. What a fun way to get into the backcountry! Please get in touch with us if a Yellowstone Park pack trip sounds like it might be up your alley! We currently work with both a mule pack outfitter for a more extensive trip, and a llama outfitter that provides a more flexible and lighter weight option for those willing to hike in while having their gear sherpa’d and their camp fully staffed. The Madison fished well through the summer, with good hatches lasting throughout the month of July. We entered this season knowing that, after 9 long years, we finally had a repaired Hebgen Dam. Having cold water throughout the summer resulted in not only prolonged hatches during July, but also some of the best hopper fishing we have seen in YEARS. It was fun to see the incredible summertime fishing of the Madison return so quickly! September rolled in and summertime continued until the last week of the month. This was the warmest and driest September we can remember with relatively little moisture recorded during the month. There were a few days of snowcapped mountains down in the Madison Valley which paired nicely with the fall foliage and on those sunny days, this was an amazing sight to behold. The hopper bite continued into the middle of September and dropping a tungsten bead pheasant tail was key on some days. Not exactly breaking news, but nymphing with black rubber legged stone fly nymphs and small serendipities also worked quite nicely towards the end of September. Henry’s Lake came into it’s own in September with multiple weeks of exceptional angling for truly jumbo trout. While numbers remain lower than some locals remember, the size of the fish we saw this year more than made up for the longer time in between grabs. What is jumbo, you ask? Well, if the locals are talking in pounds rather than inches, you know that’s probably a good indication! On September 21 and 22 we held our second annual West Yellowstone Trout Spey Days. Weather was perfect, and those who came out were able to learn more about Spey casting and Trout Spey fishing from a great group of presenters that included our own Matt Klara as well as Kurt Kruger (Far Bank), Alice Owsley (local guide and owner of Riverside Anglers), and Jake Zirkle (G. Loomis). We also had a ton of gear and sales reps on hand from companies including Sage, Rio, Redington, Thomas & Thomas, Echo, Airflo, Winston, Scientific Anglers, Orvis, C.F. Burkheimer, and G. Loomis. Attendees were able to try out just about every trout Spey kit on the market. The event finished off with a fun cookout back at the shop and planning for how to make the event even better next year. Speaking of next year, stay tuned for dates for the 3rd annual Trout Spey Days! Late September through the month of October found our guide staff splitting their time between Yellowstone Country and the Missouri River. For almost 25 years, Jonathan, Joe and Steve have been spending their Fall in and around Cascade, Montana. They show up and hang out with fellow BSA guide Greg Falls who lives on the river every single day of the season. Greg loves to fish the upper river with different nymphing techniques and knows where all the large, rising brown trout live as well. While there are always great days of nymphing to be had on the Missouri, we really try and concentrate our efforts on the dry fly and streamer games, just because we think it’s more fun. Rods are rigged with floating and sinking lines for streamer fishing and there are always a smattering of dry fly rods rigged up with caddis, BWO and pseudo imitations. If a fish rises, we drop the anchor and prepare to catch it with a properly placed dry, a reach cast, and some stack mends. Back home in West Yellowstone, late September and October found our shop staff and guides swinging flies in the Park on the Madison, poking around the Henry’s Fork on those perfect days looking for heads, and of course spending plenty of time down in the Madison Valley. This Fall, in the Park specifically, the run of lake fish was off just a little bit. Most of that, we think, was due to the lack of rainfall in September and the sunny days that made for an everlasting Indian Summer. Towards the end of October we were treated to some scuzzy days and the brown trout came out in full force. In late October and through November, several members of our crew took the opportunity to travel and explore some different land and water. Joe ventured to the east to chase birds with Stella. Justin headed to British Columbia for his annual steelhead trip and found some real beauties on the swing. Donovan visited our friend Capt. Greg Moon in Louisiana to try his hand at wrangling the giant redfish down in the Marsh. Miles was back in New York chasing Stripers for a few days, and Said ventured south to Mexico on his first bonefish adventure. Matt was in So Cal for Thanksgiving and had a great turnout for his presentation at the Pasadena Casting Club, which he followed up with some great fishing off the coast with Capt. Vaughn Podmore for bonito, calico bass, barracuda, and more. And so, we have come full circle on 2018. We wish everyone a happy, healthy, and save winter season, filled with joy and fishing. Remember, we are open all winter, so don’t hesitate to get in touch if you are looking for tying materials, or anything for an upcoming trip. We are also here and happy to talk fishing if you have questions about our area or any of the fisheries we visit, or technical aspects of the game like Euro Nymphing, Spey, or local hatch matching. Stay tuned for more news, technical content, and updates from our fishing in Patagonia!